Todo libro es un tesoro, y no tiene nada que ver el precio dé éste, a veces por poco dinero encontramos libros magistrales. Así es. Es frecuente que poco aparenten los que más valen. Como en todas las cosas de la vida. Así suele suceder Lino, que lo más valioso está en lo humilde. Los libros y las Bibliotecas son grandes profesores de la vida, las bellas bibliotecas son para perderse en ellas, y los secretos de los libros para maravillarnos. Esta biblioteca de Coimbra es preciosa. Así es justamente la que me gustaría tener en mi casa. Eso sí reemplazaría el retrato por uno mío. Verstehe ich richtg, Sie werden später in anderen Artikeln uns Details des “Roten Buch” geben ? Diese Buch habe ich nicht, aber in dem Bibliothek habe ich von Jung nur “Psychologie und Alchemie” – sehr schwer zu lesen. Sorry, ich verstehe nicht, Spanisch und daher würde Ich Ihnen bitten, wenn möglich, Ihre Texte in Deutsch, Französisch oder Englisch zu übersetzen. Macht nichts, dass nicht perfekt geschrieben werden – echt korrect kann ich nur in meine Muttersprache schreiben (nud dass ist nicht Deutsch). Leider kostet es mir sehr in die deutsche Sprache mich verständlich zu machen ohne Mühe, aber in die Zukunft will Ich versuchen mindestens eine abgekürzte Version meiner Artileln über das Rote Buch in Englisch beilegen. Freut mich dass Du Dich so interessierst über was ich schreibe. Alles Gute, Cornelia. 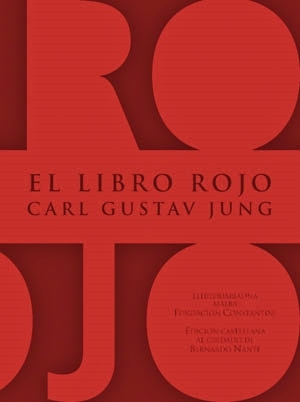 Trying to summarize what this article explains, I begin by telling that the Red Book tells about the introspective study of his unconscious mind that Jung underwent during the years 1913 y 1930, an investigation that had powerful effect in the ellaboration of his most important psicological theories, for example those concerning individual and collective unconscious and archetypes. 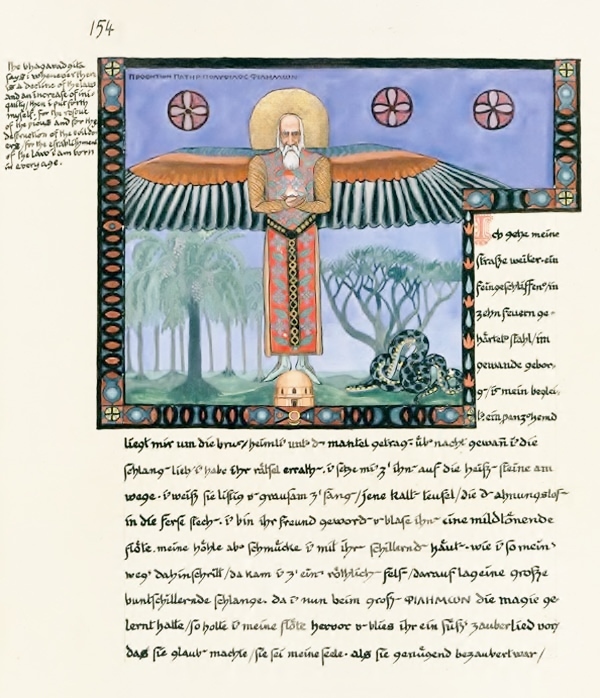 The Red Book, an infolio manuscript written in gothic german letter (fraktur), adorned with precious illumination and great paintings, is the result of that study. 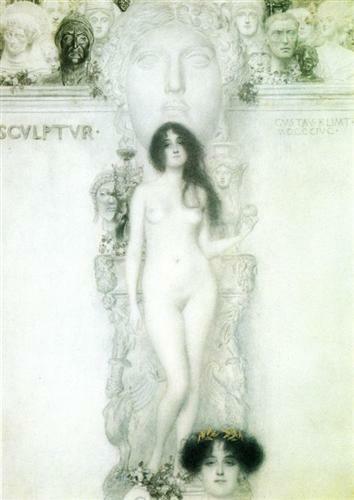 The book remained unpublished almost fifty years after Jung’s death in 1961. After the reluctant authorisation of his succession, it was published in fascimile in 2009. 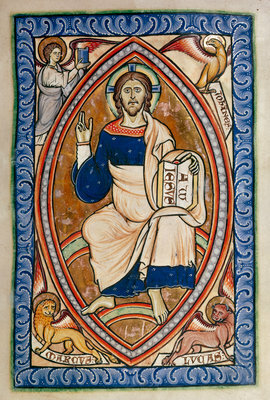 The aspect of the book is that of an illuminated medieval manuscript. Jung confesses in the first paragraphs of the book, that although nothing in the spirit of time (Zeitgeist) justifies what he has to announce, a force greater than that of the spirit of time compells him to tell it. He continues saying that the spirit of time wants only know about utility and value, but the spirit of deepness that moves him has, from ancient times and until all the future, more power, so that the work done under its light has much more significance. 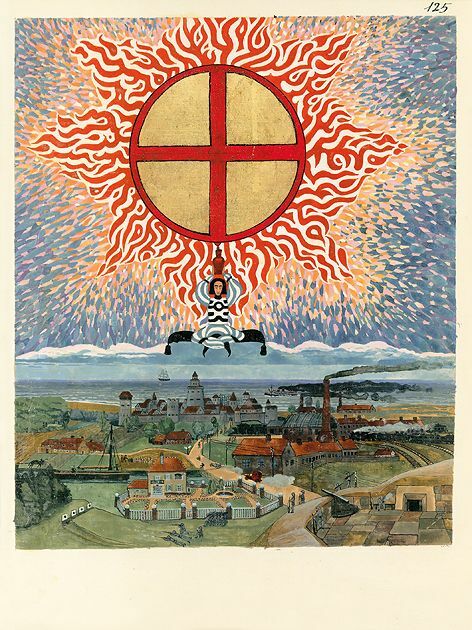 The spirit of deepness, associated with spiritual traditions of humanity, confesses Jung, has subdued his scientific pride and robbed him his faith in science, and also his joy in explaining and classifying, resulting in the extinction of the ideals of time in his person. That spirit forced him, he declares, to descend to the last and most simple things, things pertaining to his imagination and phantasies more than to his reason. It is a book full of difficulties and need of deep interpretation. In future posts I will try to accentuate its principal features. Para quien tiene amor por los libros, así es. Yo me sentiría emocionada si estuviera en su lugar. Buen provecho! !